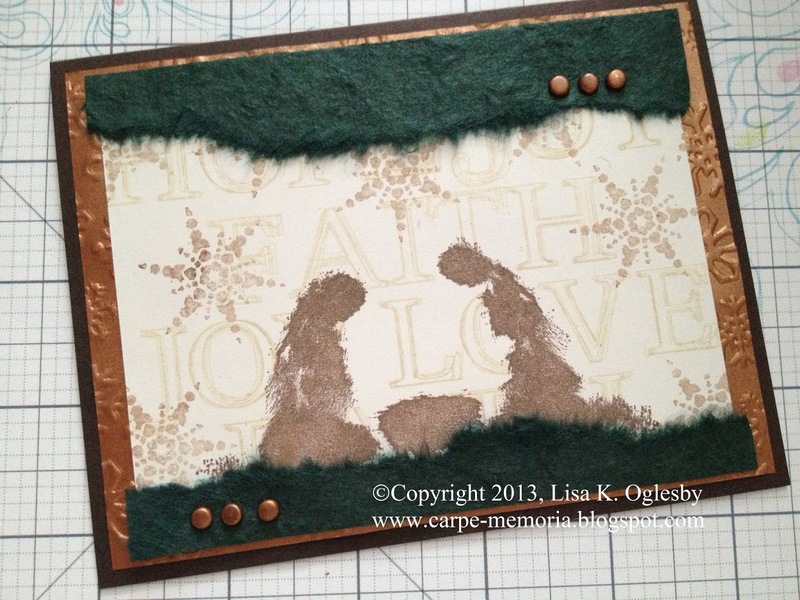 Carpe Memoria: It's Blog Hop Time! Welcome, Hoppers! If you have just left Tiare's blog at iClassyGirl.com, then you are at the right place. If not, then hop on over to Club Scrap Creates to start at the beginning of this month's hop, so you don't miss any of the fun and creativity! So, I was looking at the UM rubber, and the large words caught my eye. As a Christian, I believe that Jesus is the embodiment of these words: Hope, Faith, Love, and Joy. I realized that I had my connection between Lock & Key and Christmas! 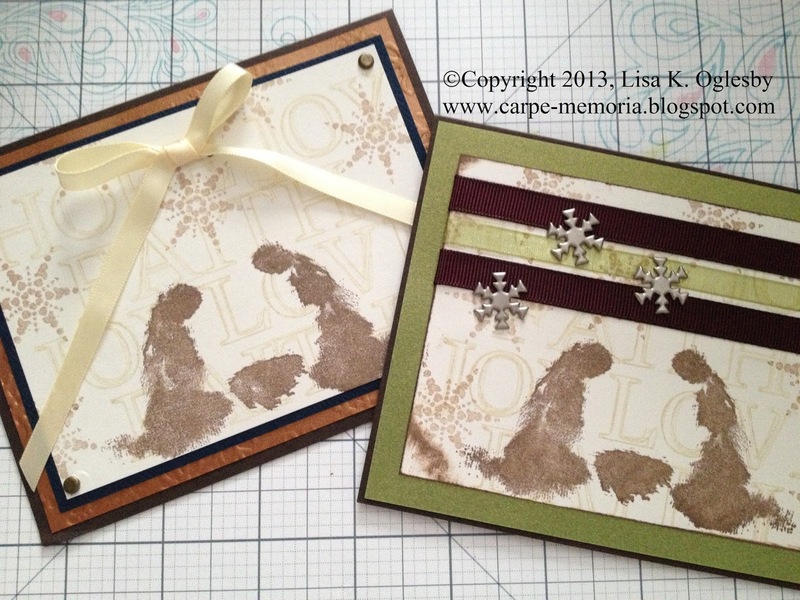 I paired the words with the holy family and a snowflake from the Silent Night (December 2010) unmounted stamp sheet. Such unique artwork, don't you think? Here's one of my final cards. Below you find the basic steps I used to create this unique card and four others. However, if you are ready to hop on, your next stop is Marya's blog at A Notebook Novel. To start the cards, I stamped each of the ivory panels with the words using Club Scrap's Sandstone ink. An acrylic block with lines on it comes in real handy for keeping words straight. 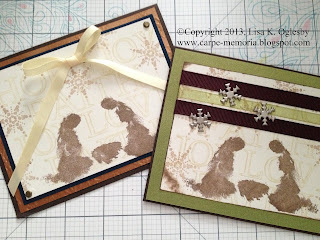 On the words, I used CS Earth ink to stamp the holy family, then added snowflakes at half strength. Some folks call that "second generation" stamping. You just ink up the stamp, then stamp once onto scrap paper and then onto your project. You get half the amount of ink. I like the way Joseph, Mary, and the manger really stand out darker than the other elements. I stamped five similar ivory panels. When using metallic paper, I love to emboss it--there's something about the way the light hits the raised areas on metallics. Anyway, I used a Fiskars embossing plate for four of the panels and a Cuttlebug folder for the fifth. Since this Cuttlebug folder doesn't have an all-over design, I wasn't sure how I was going to use it, but I came up with a way. 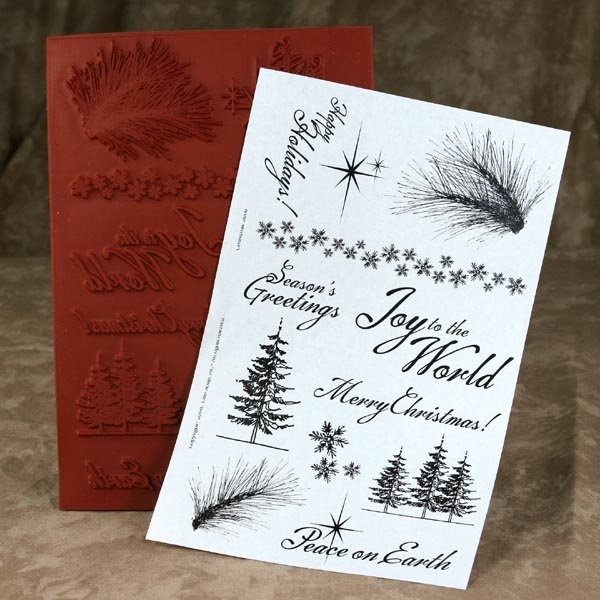 Below are the embossed panels. The fourth one is the Cuttlebug one. And here, again, is my favorite of the five cards. I just layered the stamped and embossed panels on the card base and added some torn handmade paper and brads (the paper was from a 2003 (?) CS kit called Evergreen. I like the addition of the green for Christmas, but a deep red or burgundy would look nice. Below are the other four cards. 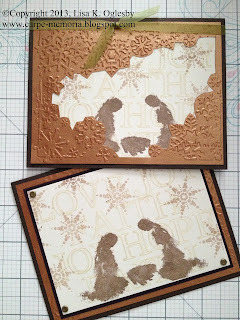 You can see the way I used the Cuttlebug embossed metallic on the top card--just cut along the image with a craft knife to create a frame. I hope you enjoyed a little early Christmas cheer using Lock & Key in an unexpected way. Next month's kit is Fire & Ice. Oh, dear!! Thanks for making it to the end of my post. Your next stop on the hop is Marya over at A Notebook Novel. I'm looking forward to her Lock & Key creation! Lisa, these cards are so thoughtful and beautiful. I love how you paired this kit with Silent Night. Stunning! Thanks for sharing. Beautiful cards! Clever use of the oversized words...I just love the combo! Loved these cards very inspiring - the use of the two kits for the Christmas theme and then throwing in Evergreen - my first CS kit! I think I still have a few sheets of that - thank you for the ideas! Love those cards and I'm so in awe of your creativity. Wonderful job onn the cards! Those stamps go together so well. I love how you combined the text and holiday images to make such a beautiful set of cards! Thank you for hopping with us again this month and for stepping out your great ideas! These are great Lisa! The words stamps really make a lovely background for the images - they give some texture, but also really add to the theme of the cards. Clever idea! Love the cards - wow - such a great mix of kits and just lovely. You have created a stunning background and made some beautiful cards. You will have lotsof ohs and ahs when your friends get their cards. Lisa, your cards are wonderful! I love how you used the word stamps. Wonderful inspiration - Thank you! Lisa I love these. I hope to do more Christmas cards this weekend at our gathering in Durham. Very pretty and you're right...they did fit nicely with the other kit images. 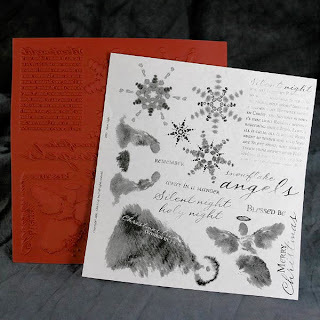 I love the Silent Night stamps, and such a gorgeous way to use them... The evergreen paper is a really nice touch, too. I love mixing different kits together for a bit of pop. Thanks for the early Christmas inspiration! I'm trying to plan my cards and this really helps!